One recurring theme in a young earner’s life is that you never have enough money to buy something outright! But what you do have is future cash flow – many years of earnings ahead. You take out loans against the future earnings to buy a car or a house that you otherwise could not afford to buy outright. You can also save and invest a portion of that cash flow for a future spending need – or even retirement. When you invest a small amount regularly in the stock market, you don’t need to be concerned about where the market is going. 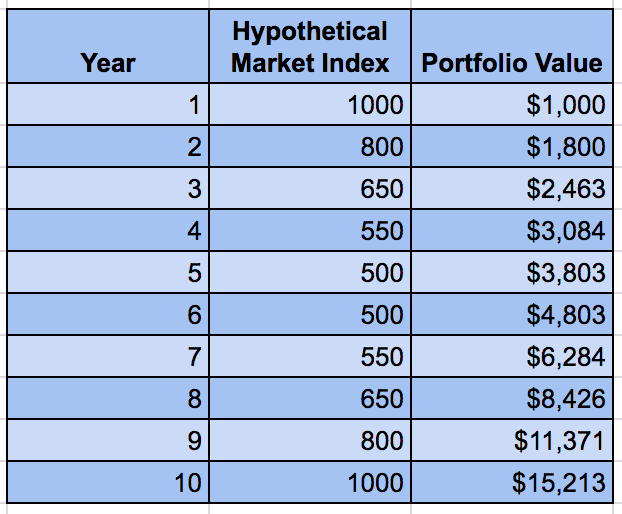 If the market goes up from there, your portfolio will grow with it. If the market goes down, your dollars will be buying more shares at a cheaper rate than before – a good thing. In either case, you win! Consistently investing a fixed dollar amount every month is a good thing. 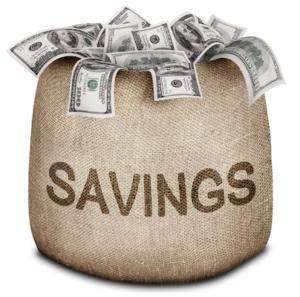 Investment professionals call this dollar-cost averaging. You don’t need to worry about where the market might be heading next. Another good thing is that it helps most investors stay calm and disciplined as market fluctuates – as it is wont to do. The market is rising – so is your investment portfolio. You should be feeling good about it. Is the market too high and about to crash? No one knows for sure but you have many more dollars to invest in future so why worry. If the market tanks, your savings will buy you even more shares. You know the markets always recovers over time. You have another 10, 15, even 20 years to go before you need this money. Your new dollars will buy you a lot more shares in good businesses than before. 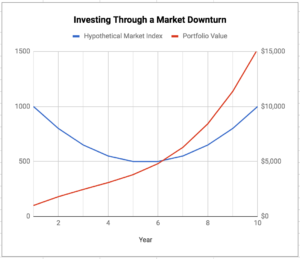 Consider this hypothetical scenario: you started investing when the stock market index is at a high of 1000 and just about to start dropping from its peak. Over the next five years, the market keeps going down every year – becoming cheaper by the year. At the end of year 5, it hits a bottom of 500 and then gradually recovers until by the end of year 10, it has reached its previous high of 1000. So in 10 years, the market has essentially come back to where it was before – overall return of zero. But if you have been investing by installments, you’d have made money even in this market. Why? Because you spread your buying uniformly over ten years – buying less shares when the market was high and buying more as the market goes down. 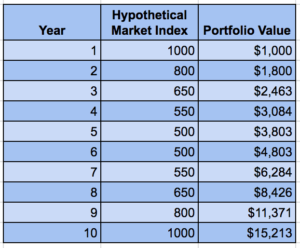 If you have invested $1000 at the beginning of each year, by the end of year 10, your investments would have grown to be $15,213. Your total gains for the period are $5,213 ($15,213 minus your savings of $1000 x 10). 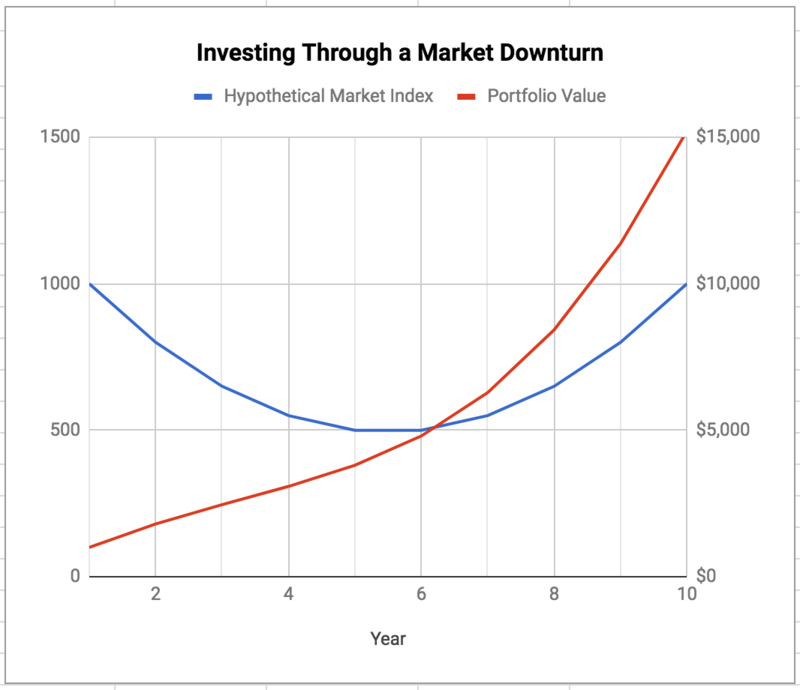 You gained more than 50% on your portfolio despite the market being essentially flat for the entire 10-year period. Sounds easy, doesn’t it? To do this successfully in real-life, you will need a steady hand – don’t panic when the market is down – and don’t get too excited when market is up. Stay even keel and stick with your investing schedule. « Seeking instant wealth? Don’t! Subscribe to new posts. We send one email every Monday. Why I stay invested in stocks? Beware, the markets go down often! A very short bear market?